Medecroft from the south. A spacious villa of 1868 became a private school and was purchased by the College at auction in 1965. It opened the following year as an Art and Craft centre and, recently thoroughly refurbished, today houses the Faculty of Humanities and Social Sciences. The image to the right is of the northern entrance side of the building today showing the refurbished exterior and the disabled access ramp. To the left is an aerial view of Medecroft in 2011. To the right (west) is seen the roof of the Beech Glade residence of 1994, on the site of a 1960s staff house. East of that is the main Medecroft building with the saw-roofed former Art studios in yellow brick adjacent, with the prominent block of staff offices to the north. Across the car park lie the two floors of the former Opportunity Centre (ground floor) and Shoei building (first floor). These structures are now university teaching rooms and support services such as Goods In, portering, post, and reprographics. The image to the right is of the former entrance to the Great Hall (1939) and Gymnasium (1938) including in the pedestrian gate a representation of the arms of the diocese, then shared by the College on blazers, notepaper etc. 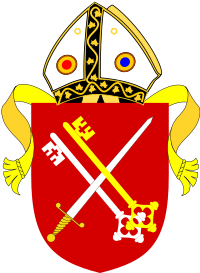 Arms of the Diocese (Arms of the Bishop of Winchester), [source]. The eponymous John Stripe Theatre, named after the Principal who had died in 1967, was opened by Sir Alec Clegg in 1969. A single storey structure, it contained a proscenium-arch theatre and surrounding offices. Despite some draw-backs–it had no fly-tower–it was heavily used and most popular for decades. A major extension occurred in 2006 when, supported by a steel frame, a first floor was added which includes flexible teaching space. The auditorium was converted to a lecture theatre with seating for some 330 people. The interior of the foyer-area and gallery-space of the building today and the staircase to the first floor.